‘A study of people and places.â€™ This was how Geography was first described to me at School, and years later it still seems to me to be a good tagline for the subject. As far as I have seen, Geography is unique. It is perhaps the most multidisciplinary subject, giving you incredible potential to immerse yourself in whatever interests you most, and discover the surprising way in which different subjects fit together. It really is a poster-child for the interdisciplinary philosophy. My name is Benjamin Laken, and I am a Physical Geographer. I studied Geography as an undergraduate degree in England at Sussex University (2004â€“2007), and then a doctorate in the subject, also from Sussex, 2007â€“2010. Since then, I worked in several postdoc research positions: firstly, for the Spanish government at an Astrophysics institute in the Canary Islands (2010â€“2014), and recently I moved to the Department of Geophysics at the University of Oslo, Norway. In this post, I will try to tell you a bit about what I have worked on, how I see geography and the opportunities it can bring, as well as the possible exciting future areas for people who are considering entering the field. I will try and give some real-world examples now, from my own experience of some of the projects I have worked on. On my personal website you can find much more information about my work, including publications, presentations, tweets, and videos. For the last four years, one of my main areas of focus has been examining connections between the Earthâ€™s atmosphere and space weather. I felt that this was an important subject, as improving our understanding of natural climate variability directly relates to our understanding of how humans impact our world. 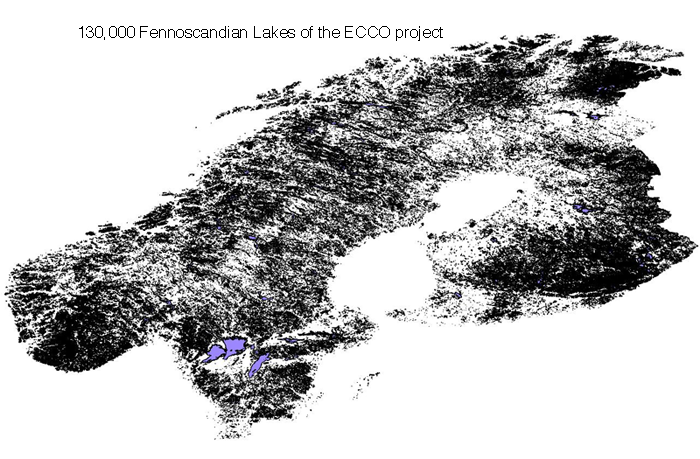 130 000 lakes of the ECCO project covering the Fennoscandian region. We aim to project changes in the ecology and properties of these lakes with global warming. As with any scientific research project, this meant spending a lot of time working with large amounts of data to test your ideas. Often, as was my case, a researcher may not have any experience of computer science before embarking on a post-graduate program. In the tradition of a PhD this usually means that you learn to work the way your supervisor worked, and so it was for me. Starting from FORTRAN 77, I learned to create procedural programs, from there I moved to a number of much more modern languages and methods. Today, I primarily rely on Python, Git, and some really exciting tools that let you access and process vast amounts of incredible scientific data non-locally. I found that the best tools are non-discipline specific, so you really learn skills that you could apply to any set of problems, whether its creating a scientific analysis, generating pixel-perfect figures to communicate your findings, or something more practical like building a database or website. Today, I am working as a Postdoctorate Research Fellow on a cross-disciplinary project in Norway, called ECCO (Effects of climate change on boreal lake ecosystems). This project aims to discover the way in which the hundreds of thousand lakes across the Fennoscandian region will respond to global warming. It essentially combines the skills of hydrologists, biologists, ecologists, remote sensors, GIS, and climate modellers, to produce a detailed picture of how this critical resource will be impacted over the coming decades. My main roles in the project are to develop and run software to identify the future climate over 130,000 individual lakes selected for the project, and to examine recent changes over the lakes and their surroundings from satellite data, and identify the specific processes contributing to these responses. These lakes are a critical resource, and our findings could likely be important in influencing decision-making and policies across the region. Within geography, you are able to take time to study a wide array of subjects, and focus on the facets of those which interest you the most. For me, this has largely been climate science, and its connection to atmospheric physics, computer science, ecology, environmental science, politics, society, statistics, physics, and many more. 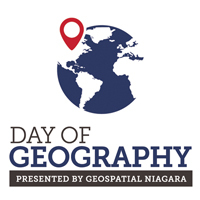 Geography gives you free reign to study the big picture of many disciplines, and interact with a wide range of people. You can really see this philosophy in action if you go to the biggest scientific meetings, such as the annual European Geophysical Union, where thousands of researchers meet to discuss an almost unbelievable range of esoteric topicsâ€”wherever you go there, you can be sure to find a Geographer somewhere! However, as a downside to the topical breadth of Geography, you find that the onus is indefinitely on you to go back over subjects which you may have only covered in a cursory manner, and deepen your knowledge as required. I would say that in Geography you will probably always feel like a little fish swimming in a big pond: as you become comfortable and familiar with one set of ideas and working tools, you find that the next subject connected to your work has a whole new range of practices and methods which you might want to learn to integrate and benefit from. It is really a subject that will always keep on challenging you. It can be as practical as disaster mapping, and on-the-ground relief work, or as theoretical as speculating on the environment and climate of alien-worlds. In Geography, the choice is yours!